Seems summer is getting very hot in Kerala this time. Its hard to adapt with the high temperatures even at the small village of mine. Drinks like Sambaram (Butter milk), lemonades and juices will help to stay healthy and cool in this climate. 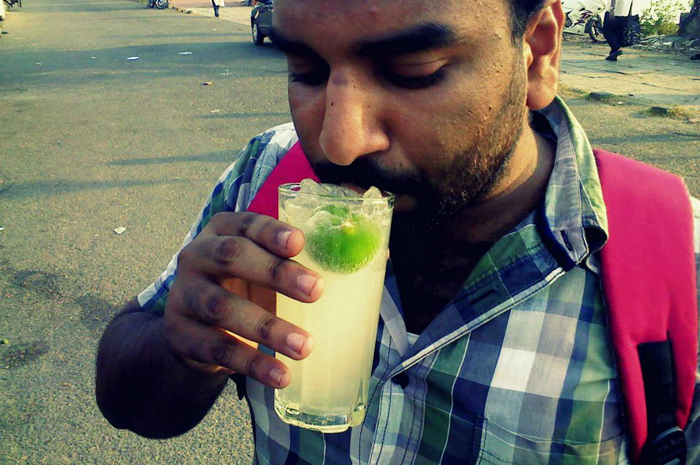 Here is a recipe of a drink popular in Kerala since last summer, Kulukki sarbath or the shaken lemonade. Word “Kulukki” in Malayalam means “Shaken” and “Sarbath” means juice. The youngsters in Kerala are now going gaga over this juice. Though this Kulukki sarbath is believed to have its origin from Kozhikode (North Kerala), it was made famous in Kerala by a street vendor called Shaji ( Shajikka as the locals call him passionately) . There is also a facebook page for Kulukki Sarabath started by Shajikka’s fans. You can learn more about Kulukki sarbath from this blog. At Rs7/ glass, youngsters consider it a steal and many prefer it because it is a natural product without any artificial additives. This is an easy to prepare drink. Every ingredients is put into a tall glass and then it is covered with another glass and is shaken in a cocktail style and served. Prepare sugar syrup with 2 tablespoon of sugar and 2 tablespoon of water. Soak the basil seeds in water for 10-15 minutes and drain them. In a tall glass, add one teaspoon of the sugar syrup. Extract the juice from half of a lime and add it to the glass. Add a small piece of the lime to the glass and add water. Cover it tightly with another glass and shake it strongly for 30 seconds. Photo courtesy : Kulukki sarbath blog at lifeisonebigblast. This entry was added on March 28th, 2014 by Renoos in Desserts and tagged with easy lemon juice, lemon juice, lemon juice recipe, green lemon juice, kulukki sarbath, ginger lemonade recipe, kerala ginger lemon juice. Last revised on April 4th, 2018.
hie, I am the person in this photo. Its good to see a photo taken during my college life. Need to know whether Shajikka’s shop is still there bcoz last time I visited that place, the whole palce was in rubble as they were extending marinedrive walk way. Praveen, He is still there. Now he is one the main road that goes to Vyppin. kan I get a number to contact shajikka to invite him for our palli perunal.